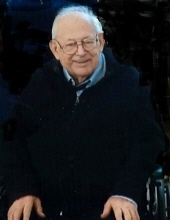 William Everett "Bill" Wilhelm, Jr. Celebrating the life of William Everett "Bill" Wilhelm, Jr.
Obituary for William Everett "Bill" Wilhelm, Jr.
William Everett “Bill” Wilhelm, Jr. 82, widower of Mary Virginia (Brooks) Wilhelm, formerly of Shutterlee Mill Road passed away on Saturday, February 2, 2019 in the Kings Daughters Community Health and Rehabilitation Center. Mr. Wilhelm was born on June 3, 1936 in Buffalo Gap, a son of the late William Everett, Sr. and Grace Elizabeth (Martin) Wilhelm. Mr. Wilhelm attended First Baptist Church of Staunton, he was retired from Western State Hospital with over 18 years of service and later was employed at the West Beverley Street Food Lion. Bill will be remembered for his love of music and his willingness to share his talent with his many friends at church. In addition to his parents and second wife Mary Virginia, Mr. Wilhelm was preceded in death by his first wife, Linda (Eckert) Wilhelm, and a brother, Raymond E. Wilhelm. Surviving are two sons, Jeff and Melvin Wilhelm; a daughter, Melinda VanGuntun of Stuarts Draft; six step-children; two sisters, Virginia E. Cash and her husband Dudley of Lexington and Mary E. Wilhelm of Staunton; a grandson, Wayne Wilhelm; three great-grandchildren and four nephews. The family will receive friends from 6:00 – 7:00 p.m. Wednesday, February 6, 2019 in the Coffman Funeral Home and Crematory. A Funeral Service will be conducted 11:00 a.m. on Thursday, February 7, 2019 in the First Baptist Church by Rev. Steve Traylor and Chaplain Murphy Terry. Burial will follow in Augusta Memorial Park in Waynesboro. It is suggested those desiring make memorial contributions to the Augusta Health Foundation Hospice of the Shenandoah, P.O. Box 1000, Fishersville, Virginia 22939. To send flowers or a remembrance gift to the family of William Everett "Bill" Wilhelm, Jr., please visit our Tribute Store. "Email Address" would like to share the life celebration of William Everett "Bill" Wilhelm, Jr.. Click on the "link" to go to share a favorite memory or leave a condolence message for the family.